One of the most frequently used rooms in the entire house is the bathroom. At times, it is a quick shower while other times it is a leisurely soak in the tub. Maybe you only need to curl and comb out your hair at the vanity and of course, there are those important trips to the toilet to relieve yourself. Just think about all the plumbing fixtures that all this action involves along with the wear and tear on the flooring. No wonder your bathroom is now ready for a professional renovation! Before you proceed, consider the following important factors. How much money you can afford to pay for a bathroom renovation is your first decision. You must understand this before you can figure out how extensive the task will be for the professional you hire to perform it. Maybe your bathroom only requires a new tub, shower and toilet to complete the remodel. On the other hand, this room might be in such bad shape that you need the professional to gut the entire room and start from scratch. Decide before you proceed how drastic the changes should be in this room. If you are starting from scratch, you must select whether you desire a modern, contemporary, classic or even traditional design. Each one will have its own unique elements to offer your bathroom. When you select one style over another, it also makes it is easier to choose which plumbing fixtures to place in the bathroom so you should decide this early in the process. The colour scheme of the bathroom is important, as it at times will correspond with the overall style of the room. For example, classic typically includes white or neutral tones. Once you select the scheme, it will influence other choices such as flooring, paint colours and vanities. You may just want to improve the appearance of your bathroom and not its level of functionality. During a remodel, though, is an ideal time to add certain features such as massage jets in the shower, towel warmers, safety bars and other amenities that increase the usefulness of the bathroom. Flooring options are plentiful today ranging from vinyl to ceramic tiles. Remember, the bathroom is the one room in the house where you may walk on the floor with damp feet, so whichever flooring option that you select should not turn slick when wet to prevent falls and injuries. 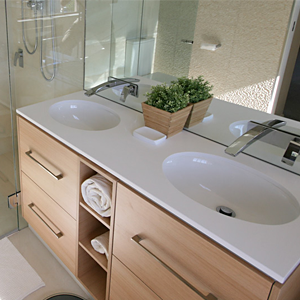 The above factors are just the major ones to consider when planning for a bathroom renovation. You also have lighting and accessories to select as the professional proceeds with the remodel. To ensure the end product is exactly what you had in mind, thoroughly think about every detail.